Improvement (WACCI), University of Ghana, has said. transformation of agriculture in West and Central Africa. the strengthening of graduate schools in Africa to attract gifted students. investments in the Centres on a case by case basis. design, which was organised by WACCI, University of Ghana. the market and the industry. of farmers in the country use improved varieties. the needs of people and meet the market demand as well. meet the demand of markets and industry. for breeders to interact with people in the value chain. with varieties that would be much easier for farmers to adopt. The fall armyworm crisis has brought to the fore one of the multifaceted failures that characterise the sad state of affairs in Kenya’s agriculture. Ours is an agrarian economy and any shocks due to diseases, pests or climate change leave farmers susceptible to severe losses besides heightening the risk of starvation. The resultant instability in commodity prices influences inflation. It, therefore, makes sense to find a solution to the predicament; hence the in-creasing calls for adoption of genetically modified organisms (GMOs) technology in agriculture. Indeed, genetic engineering (GE) is a potent tool to combat plant diseases. In many places, it has proved effective in developing plants that are resistant to pests, such as the European corn borer in the United States, and viruses such as the one that was the cause of papaya ringspot in Hawaii. However, GE is not the panacea for all crop problems. Usually, its success depends on the availability of what scientists call “simple genetic traits”. For example, if GE is to be applied against fall armyworms, the resistance to the pest has to be mediated by ideally one or a few genes. If many genes are involved, GE just cannot work. The phenomenon makes the resistance trait complex — as with most pest and disease resistances in plants. GE has, hence, been used in breeding for only a handful of crops and a few traits. The US has the highest number of GM crops with only 10 commercially produced as GMOs. They are maize, soybean, papaya, canola, alfalfa, cotton, sugar beet, squash, potato and apple. For a vast majority of agriculturally important traits such as yield and most pest and disease resistances, there exists a wide array of technologies for improved crop varieties — including conventional breeding, marker-assisted breeding and genomic selection. While the debate on whether or not cultivation of GMOs should be allowed in Kenya rages, it is not the magic bullet to our food security challenges. Instead, the government needs to heavily invest in agricultural research, attracting and retaining skilled scientists and incentivising the translation of research output into improved crop varieties. Even after the fall armyworm scourge, cli-mate change and other emerging pests and diseases will give us greater challenges to contend with. The only way to assure food security is to anticipate these challenges and build responsive rather than reactive agricultural systems. For every crop production region, we need teams of soil scientists, plant breeders, plant pathologists and agronomists constantly working in concert to develop improved varieties for future release. Also needed are properly functioning seed systems to facilitate scaled production of improved seeds. Also vital is good infrastructure to convey produce to markets. While I support speedy adoption of GE in Kenya, the issues plaguing our agriculture are more complex than is admitted. But we have the requisite resources intellectually and otherwise to turn the tide. Food security is a greater concern than ever before. According to one study by the United Nations, the human race may not be sustainable by the year 2100, because massive food shortages will be a major problem. Modern food security concerns are not so severe, but they are still serious cause for concern. Climate change is making it more difficult for societies to produce the food they need to sustain the growing population. Food deserts are also a growing concern. Of course, one of the biggest concerns of all is the number of health problems people have these days, which make it difficult for them to consume food. While all of these challenges present serious concerns for the global community, they also offer new opportunities for dedicated entrepreneurs. Here are some ways that business owners are tackling food security concerns to generate a profit. Food shortages are one of the biggest concern is that the world faces in the 21st-century. The biggest concern is not producing enough food for the world, but rather making sure that it is accessible. Unfortunately, it is difficult for agricultural companies to develop the necessary supply chain networks to distribute food to people that need it. Some regions are too far away for them to ship food and ensure its quality. Others are not even accessible at all. Many entrepreneurs are coming up with solutions to scale food production. These include new aquaponic systems, which can help people produce up to four times as much food with 90% less land and water. Other solutions allow people to grow food in their own homes, which is ideal for people living in urban areas where they don’t have large plots of land to grow food on. Unfortunately, many people have serious health problems which limit their ability to eat. Food allergies are obviously the biggest issue that they face. One of my brother’s old friends was allergic to almost every natural food known to man. He had to live off of special food that wouldn’t trigger an allergic reaction. While food allergies are the biggest reasons that people can’t eat normal food, there are other health problems that require attention too. They may have health problems that make it hard for them to process food without using a food thickener. The good news is that new thickeners such as Simply Thick have filled this void. Food is one of the most basic human needs. Unfortunately, even in the 21st Century, it is not always readily available. There are a lot of reasons that people face the risk of starvation. There are a number of problems that require solutions. Clever entrepreneurs that tackle these problems will have the opportunity to make a lot of money, while also getting the satisfaction of doing good for the world. What problems do you think food entrepreneurs will tackle next? The opportunities seem virtually endless as we enter a new era of food security challenges around the world. The post Solutions for Food Security Challenges Remain Excellent Ideas for Entrepreneurship appeared first on Catalyst For Business. The eight mountain districts of Provinces 6 (Karnali) and 7 are some of the most food insecure areas of Nepal, with higher prevalence of poverty and stunting than any other area or the national average. The frequent occurrence of shocks such as the 2015/16 winter drought poses further risks to food insecurity. For more information on the food security situation of these areas, please visit To track seasonal changes over time, a food security monitoring survey panel was started in November 2016 and repeated in June 2017 and November 2017. Overall food security situation has improved in the mountain districts of Provinces 6 and 7 in the first trimester of 2018, with a decrease of 43.8 and 33.1 percent in households consuming an inadequate diet compared to June 2017 and November 2016 respectively. This figure (23 percent) remains notably higher than the national average (AHS, 2015/16). The contribution of unskilled daily wage labour and remittances to household income has increased in April 2018 compared to June 2017. However, cereal-based agriculture still remains the primary and dominant source of income. The food security situation is found to be better in households with relatively stable income sources. Households surveyed in April 2018 faced fewer shocks compared to June 2017 but more than November 2016, using fewer and common coping strategies such as borrowing food or money, consuming less preferred foods and reducing size of meals, and exhibited lower propensity to recover from shocks, mainly in Karnali Province (Province 6). Step 1: Face to face baseline survey using a representative sample of the population: The baseline survey conducted in November 2016 used a multi-stage stratified cluster design in which 98 primary sampling units (PSUs) were selected at the first stage followed by 15 households interviewed in each PSU at the second stage, for a total of 1,470 households. In this survey, a total of 48 new PSUs were selected to interview and out of 50 repeated PSUs, about 78 percent of sampled households had a phone number and agreed to be contacted via telephone calls in the subsequent survey rounds, while a total of 152 repeated sampled households without telephone number were included in the face to face interview. In addition, 92 traders from markets in the vicinity to the PSUs and the district headquarters were also interviewed. Step 2: Dual mode panel survey (live telephone calls and face to face survey): Following the baseline survey, trained call operators from a call center made live telephone calls to the panel households with a phone number while field enumerators conducted face to face interviews for the panel households without phones and non-reachable households with phones after sufficient call attempts. A total of 300 households and 34 traders were successfully interviewed in April 2018, fifteen months after the baseline survey in November 2016. March 2014, World Development Movement(WDM) campaigners dressed as business people from Monsanto, Diageo, SABMiller and Unilever delivered a cake to the Department For International Development to “thank” the UK government for its support in allowing them to carve up Africa. In early June the EU Parliament voted to accept a report put out by it’s development committee, in which The New Alliance for Food Security and Nutrition, an initiative of the Obama administration and the G-8, including the Gates Foundation, was heavily criticized for being ineffective as a means for improving world development. In their article, EU parliament slams aid scheme that uses big agribusiness to ‘feed Africa’, Global Justice Now applauded the decision, as does AGRA Watch, agreeing that the New Alliance is an initiative meant to benefit big agribusiness instead of helping small-scale farmers, and vulnerable communities. It’s past time that world governments are held responsible for the funding of such initiatives that serve their own business interests over those of farmers and local communities. March 2014, World Development Movement(WDM) campaigners(above, below) dressed as business people from Monsanto, Diageo, SABMiller and Unilever delivered a cake to the Department For International Development to “thank” the UK government for its support in allowing them to carve up Africa. The EU has spent over one billion dollars implementing the New Alliance, and the UK Department for International Development(DFID) is responsible for sending $600 million to date. Dutch asset manager PGGM and Switzerland’s UBS Asset Management have partnered to develop an impact measurement framework and methodology that tackles food security, the UN’s second Sustainable Development Goal (SDG). In a joint statement, the investors said they had launched a sponsored research project with Wageningen University & Research (WUR) in the Netherlands and Harvard University in the US. 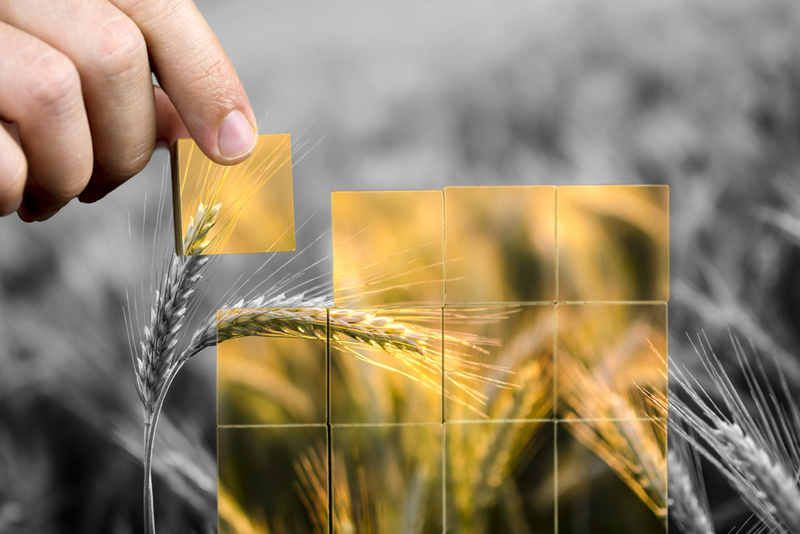 The project aims to build scalable models that can be applied to global listed equities of companies selling technologies to improve agricultural yields and access to nutritious food. The research project was initiated by UBS AM two-and-a-half years ago, after its sustainable development team was selected by PGGM – the asset manager of the €197bn Dutch healthcare scheme PFZW – to manage a €1.5bn mandate of listed equities for its impact strategy. PFZW selected food security as one of its priority areas for investing in solutions with a real-world impact. “With the global population approaching 9bn in 2030, it is evident that providing food poses a great challenge, especially if we consider nutritional quality, access to food and resource productivity,” said Piet Klop, senior adviser for responsible investment at PGGM. “To tackle such a complex issue, we partner with the best in finance and [the] academic community to develop a replicable, science-based methodology for measuring impact in food security. WUR, a leading Dutch university focused on healthy food and living environments, will examine the link between technologies produced by listed companies and agriculture yields. Harvard’s TH Chan School of Public Health is building models that provide deprived communities with access to nutritious food. Dinah Koehler, executive director of the global sustainable equities team at UBS AM, said that the research would focus on four food security-related metrics. UBS AM said it also wanted to deploy academic expertise to develop impact measurement methodologies for climate change, air pollution, clean water access and healthcare, in line with other relevant UN SDGs. It has already begun developing models in conjunction with Harvard University. My last line of the part II of this article ended with two pertinent questions. Can Africa afford GMT? What is the viable strategy for Africa to benefit from cutting – edge technology? On cost of research and development of the GMT for a particular crop, GMO, averagely, GMO takes 13 years and $130 million of research and development before coming to market (https://gmoanswers.com/ask/). From another literature, “GMO Answers”, the cost of generating a new genetically modified crop is $136 million with an average of seven years duration. This is why in the developed countries; private sector is the major driving force for research investment to develop GMT. Thus, the Biotech Companies rely on patents to safeguard their investment. These patents are protected through the World Trade Organisation (article 27), the International Union for the Protection of New Varieties of Plants (also known as UPOV), and laws of the member nations. This staggering cost of research is certainly very difficult for individual African countries to invest. Again, this exorbitant cost of developing GMO sometimes makes one to wonder whether the investment is really worth the effort. However, according to an expert, Prof Graham Brookes, an agricultural economist at PG Economics Ltd, UK, he was quoted saying, “the main reason why GM crops contribute to reducing the cost of food worldwide has to do with the very nature of the biotechnology involved, which helps farmers increase production, thanks to herbicide and pesticide resistant crops”. In terms of productivity, Brookes says that new biotechnology has generated the equivalent of “an extra 122 million tons of soybeans, 237 million tons of corn, 18 million tons of cotton lint and 6.6 million tons of canola” between 1996 and 2012. This means that the increase in productivity goes hand in hand with savings on pesticides and fuel compared to conventional methods. “When added to the extra income arising from higher yields, the net farm income benefit from using GM technology has been equal to $116.6 billion during that same period”, according to the expert. Ultimately, GMO crops, through their environmental sustainability, potential for nutritionally fortified foods, and increased productivity, actually play a key role in keeping the cost of food down and making the investment pay higher dividends. On the strategy for Africa to benefit from this cutting-edge technology, already, some African countries such as South Africa, Egypt, Burkina Faso and Sudan have since released some GM crops at commercial level. However, these GMO crops were developed and brought into the continent by giant global seeds companies such as Monsanto for purely profit making. These companies have secured the patents of these crops making it difficult for African researchers to develop their commercially viable GMOs. Already, the companies have already secured patents for some GM crops such as maize, soya, cotton and golden rice. In addition, the countries where these companies originated are assiduously promoting the GMO crops through special support for enactment of biosafety laws in African countries. According to report by ‘Friends of the Earth International’ it stated that “The US administration’s strategy consists of assisting African nations to produce biosafety laws that promote agribusiness interests instead of protecting Africans from the potential threats of GM crops,” said Haidee Swanby from the African Centre for Biosafety, which authored the report commissioned by Friends of the Earth International. Unlike Europe and other regions where strong biosafety laws have been in place for years, most African countries still lack such laws. Only seven African countries currently have functional biosafety frameworks in place. “African governments must protect their citizens and our rights must be respected. We deserve the same level of biosafety protection that European citizens enjoy,” said Mariann Bassey Orovwuje from Friends of the Earth Nigeria. Globally, markets for GM crops have been severely curbed by biosafety laws and regulations in the past decade. Consumers in some countries were reported to have vehemently rejected GM foods and crops due to unfounded belief that GM foods may have adverse effect on human beings. It is this belief that produced a global agreement known as “the Cartagena Protocol on Biosafety”. The Protocol came into force in September 2003 and it was developed to ensure “adequate safe use, handling and transfer” of GM organisms. As the debate for and against GMO crops continue to rage globally, researchers of Biotechnology are certainly not resting, they have already developed “Gene Editing and Other New Breeding Techniques”. These new techniques are targeted to provide a ‘Second Chance’ for worldwide embrace of Genetically Engineered Crops, which will completely allay the fear of GMO crops not being “natural” or “messing with nature”. New Breeding Techniques (NBTs), particularly CRISPR gene editing, which mimics natural breeding, may provide a regulatory work-around to open the door for a new generation of biotech innovation in the US, Europe and developing countries for acceptability by the general public according to news report. The report further stated, “NBTs offer scientists easier ways to do cisgenic breeding— involving no “foreign” DNA—allowing the development of new plant and animal varieties. NBTs like CRISPR/Cas9, TALENs and ZFN do not fit neatly into the GMO definitions crafted by the various regulatory agencies around the world. Its proponents believe gene editing is similar to but faster and more precise than mutagenesis (creating new varieties by using radiation or chemicals), which is not regulated; there are hundreds of mutagenised crops sold as organic. It’s also similar to what can naturally occur in nature”. Still on the strategy for Africa to exponentially benefit from GMT, it is quite clear that an auspicious progress has been made on GMO/GMT in advanced countries with several patents recorded for individuals and organisations. Despite this progress, researchers in Africa have plenty of opportunities to develop GMO crops to address the peculiarity of natural challenges against agricultural productivity. However, the process of GMO crops development requires massive investment by governments and private sectors. Huge fund is needed for research, development, awareness creation, extension, advocacy and regulations to make achievement of food security in Africa a reality. In this regard, the recent concerted effort of National Agricultural Seed Council (NASC) in organising SEEDCONNECT Conference and Expo 2018, is highly commendable. The conference was organised in Abuja between 5th and 6th June, 2018. Some of the objectives of the conference were to identify critical gaps and develop a strategic framework for scaling up delivery of high quality seed to farmers. At the end of the two days conference, part of the communiqué recommended massive public awareness creation on the GM technology, which should carry along all stakeholders. It further recommended adequate investment in the seed value chain; training of cooperative youth and women group to take advantage of the opportunities that abound in the seed sub-sector. More of these types of platforms are needed across the African continent to overcome the challenges of food insecurity as we move towards 2050 when the population estimate of Africa will reach 2.5 billion people. sub-Saharan Africa, 20 to 80%of corn yields may be lost since of a semi-parasitic plant, Striga. In locations infested with Striga, farmers might even lose their whole crops.In a new study, researchers from southern Africa identified numerous ranges of corn resistant or tolerant to Striga. Significantly, these varieties also have actually improved nutritional material, especially protein.The mix of Striga tolerance and enhanced nutrition is crucial. Farmers, as well as regional populations, will benefit, says Peter Setimela, a research study co-author. Setimela is a researcher at the International Maize and Wheat Improvement Centre in Harare, Zimbabwe.Striga problems can force little farmers in sub-Saharan and southern Africa to desert their farms. of protein.”Normally, corn is poor in vital amino acids. Human and animal bodies cannot make these amino acids. They have to be gotten from food,”says Setimela. , consisting of yield, height, vitality, and kernel weight.Researchers discovered four ranges of high-protein corn that also revealed high levels of Striga tolerance and high yields. “These varieties will provide choices to farmers in locations with Striga,”says Setimela.”They will enhance food security and nutrition.”American Society of Agronomy. “High-protein corn also resistant to parasitic weed: Growers, neighborhood can benefit from increased food security. , neighborhood can gain from increased food security. ScienceDaily. Obtained June 20, 2018 from www.sciencedaily.com/releases/2018/06/180613102033.htm!.?. !American Society of Agronomy. “High-protein corn likewise resistant to parasitic weed: Growers, community can benefit from increased food security.”ScienceDaily. www.sciencedaily.com/releases/2018/06/180613102033.htm(accessed June 20, 2018).